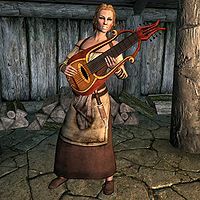 Lynly Star-Sung is a Nord bard working at the Vilemyr Inn in Ivarstead. She will take requests for five septims. If you use the persuasion option during dialog with her, Lynly will play a "special song" for free. When speaking to Wilhelm, she will state that she is unsure of her ability as a bard, and Wilhelm will boost her spirits by complimenting her on her skill. Lynly's real name was Svidi. The dialog option to accuse her of being Svidi is not dependent on overhearing any conversation. When the player gets Lynly to confess, Lynly explains that she found poetry to her fiance Sibbi Black-Briar written by Svana Far-Shield. After confiding in her brother (named Wulfur according to Svana), he confronted Sibbi about the infidelity. Sibbi killed her unarmed brother, causing her to go into hiding. Lynly wears a set of barkeep clothes along with a pair of shoes. She carries a belted tunic, a lute, and a selection of common loot and gold. She wields a leveled dagger, which can be up to Elven in quality. Lynly's special song is from Arena. It is the background music that plays while in taverns. Although Sibbi Black-Briar describes her as having black hair, she has blonde hair. Intimidating Lynly into revealing her true identity doesn't lower her disposition towards you. Lynly Star-Sung appears in the card Star-Sung Bard from the Legends Return to Clockwork City story expansion card set. She is depicted with black hair as described by Sibbi Black-Briar, and not as she physically appears in Skyrim with blonde hair. The game incorrectly runs the speechcraft check against herself rather than the player, making it impossible to pass without the Amulet of Articulation. The scene between Lynly and Wilhelm where she mentions seeing the ghost near Shroud Hearth Barrow can be observed after the quest Lifting the Shroud has been completed. This page was last modified on 11 March 2019, at 20:51.